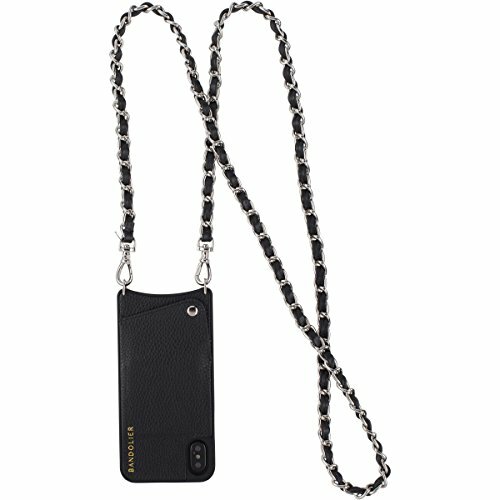 Libby for iPhone X Black Genuine Leather Women Wallet SILVER Metal Detail Designer Strap. PhoneCase Cross-Body Apple Mobile Case for ID & Credit Cards. Phone Purse Carry Handsfree by Bandolier. Free Shipping Included! Libby for iPhone X Black Genuine Leather Women Wallet Silver Metal Detail Designer Strap. PhoneCase Cross-Body Apple Mobile Case for ID & Credit Cards. Phone Purse Carry Handsfree by Bandolier. by Bandolier at DJ Luu. Hurry! Limited time offer. Offer valid only while supplies last. ✔️ DESIGNED FOR - Apple iPhone X/iPhone 10 ONLY. ✔️ CROSSBODY STRAP - Silver tone hardware. The strap length measures 52" and it's detachable. ✔️ LUXURIOUS & DURABLE BLACK GENUINE LEATHER PEBBLE CASE - will beautifully mold to your cards needs. SNAPBACK COVER - case stylishly conceals and protects credit cards, driver's license and cash. ✔️ THE ULTIMATE FASHION ACCESSORY - carry & protect your precious gadget and carry it hands-free. ✔️ SATISFACTION GUARANTEED - We proudly stand behind our product but if you don't absolutely love it, return it & we will fully refund you! If you have any questions about this product by Bandolier, contact us by completing and submitting the form below. If you are looking for a specif part number, please include it with your message.